In January, 1876 the Dunraven laden with cargo left England for Bombay. On April 6 she left Bombay loaded with cotton and wool. The trip across the Indian Ocean was uneventful and she continued on and up through the Red Sea. In the early morning hours of April 25, high land was spotted right ahead by one of the crew and believed it to be Shadwan Island. An hour later a light was also spotted which was taken for the Ashrafi Light, up in the Straits of Gobal. The captain arrived on deck at around 4am. Land was in plain sight 6-7 miles off the starboard side in a northerly direction and the captain altered course in the direction of the land. A few minutes later a dark object was spotted along the way and by the time the news reached the captain who ordered the engines to be shot off, it was too late. The Dunraven struck hard and her hull was immediately penetrated. The boat caught fire and the steam pumps were set to work right away. By 7am the water reached the engine room and put out the fires. By noon it was obvious the boat was going to go down and the crew took to the lifeboats. A local dhow took the crew onboard at around 4pm and it was then that they were made aware that their actual position was off the southern tip of the Sinai Peninsula, at Beacon Rock. When having sunk, the Dunraven landed almost completely upside down when reaching the sea floor at about 30m deep. Her upside-down bows are the shallowest part of the wreck, about 17m below the water surface. Her keel is virtually intact and it is covered with bright soft corals. 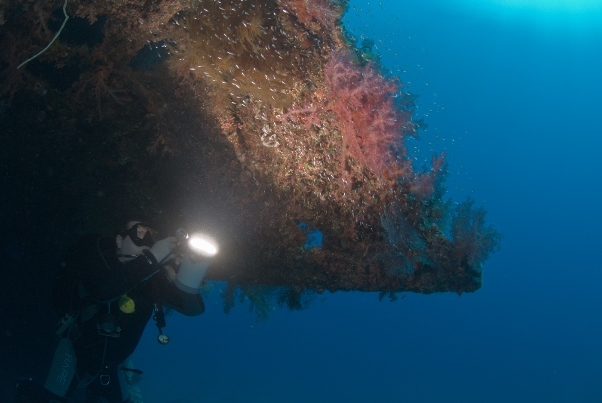 On the stern, at 28m, a coral-wrapped huge screw and the rudder can still be found, pointing toward the surface. The bows are broken and slightly separated and the whole wreck rests against the reef. A great chain still dangles from the chain holes with bright lush soft corals climbing all along its length. The anchor lies farther away from the wreck in the sand. Also in the sand near the wreck are scattered various parts of the boat, including the two masts. When swimming along the keel, in midway of the wreck where the hull is broken, the remains of some contorted metal and the large funnel can be still seen. On the inside the two coal boilers are also still visible which are circled by thousands of tiny glassfish. Next to the boilers the engine can be found still intact along with pistons, pipes, taps and valves still in good shape. 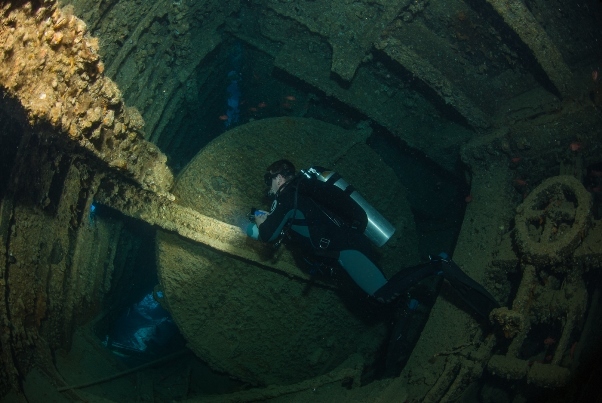 The inside of the wreck can get a bit dark in places but the port holes allow some natural light to illuminate the inside. Lying almost completely upside down, the wooden-panelled deck is now the ceiling along which runs the propeller shaft. The wreck of Dunraven hides a rich marine life. She is frequented by huge groupers, barracuda, scorpionfish, crocodilefish and on occasion mantas. It is shark fever onboard Cassiopeia! Today is about fish again because we have seen marvellous things in Egypt! Like a Rhina Ancylostoma and a Stegostoma Fasciatum or Varium. And this is only the beginning as we have just barely left the harbour… and all this at the beginning of a classical North safari. Usually March is not the most preferred month for divers in Egypt. But we still like sailing then too, map out the underwater scenery without that all that “popularity” down there. And we have found something this week without even trying. We are doing a classical North tour. We had similar luck yesterday at the Woodhouse Reef 10 minutes into our dive where at 20m deep we ran into a 1.5m long zebra shark lazily lying on the sandy bottom. 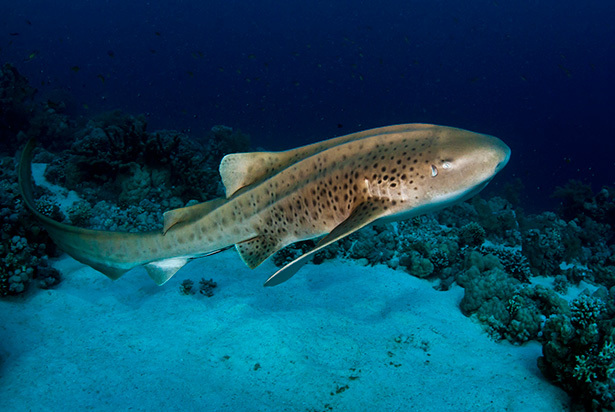 Zebra sharks can be found a bit more frequently in the Red Sea but they are still not an everyday occurrence! 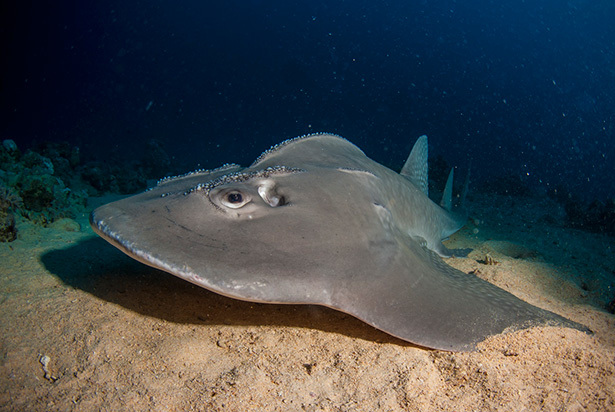 Posted in Blog, Latest newsTagged Cassiopeia, dunraven, egypt, north, red sea, safari, sharks, tour, woodhous reefLeave a Comment on It is shark fever onboard Cassiopeia!